Order by Sunday, March 24 to save $83 on each BPO Pack! A great night at the ballpark deserves a great deal… and now you can turn one family outing at Sahlen Field into two! 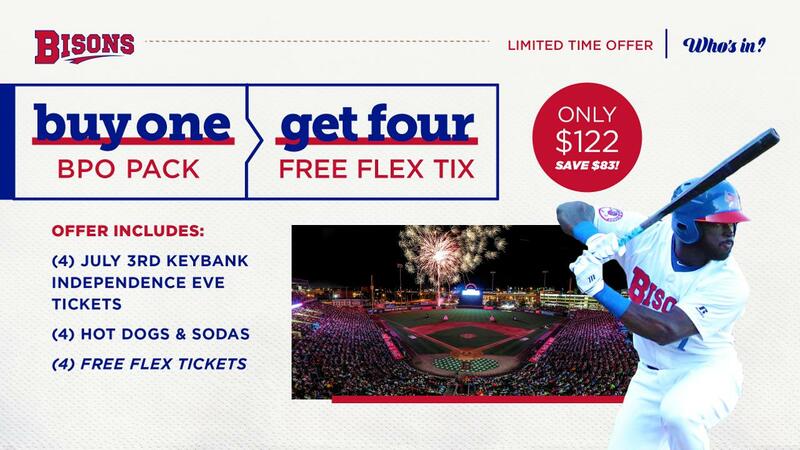 The Bisons 25th Annual KeyBank Independence Eve Celebration with the Buffalo Philharmonic Orchestra returns Wednesday, July 3rd and right now on Bisons.com you can get FOUR FREE FLEX TICKETS with the purchase of the BPO Pack for your family! The BPO Pack is already a great deal. Four tickets to the milestone year of the KeyBank Independence Eve game, four Sahlen's Hot Dogs, four soft drinks and a 25% discount at the Sahlen Field gift shops for only $122. But if you order by Sunday, March 24, the BPO Pack will also include four additional flex tickets for free! Use those four free tickets to take the family to any other game this season… even Opening Day on April 4 or must-attend nights like Star Wars Night (June 8) or Superhero Night (August 17). The flex tickets can be redeemed in any combination, so you can even split them into a couple of date nights without the kids, or even save all four for yourself! Have a larger family, don't worry… You can add as many ticket/hot dog/soda tickets you need for only $30.50 a person! Just remember, this special offer is only good through Sunday, March 24. So visit our KeyBank Independence Eve page right now and get your BPO Pack for July 3rd at the ballpark.